Does your flashlight always seem to come up missing only to find it in your children’s bedroom? Are you tired of your kid using your flashlight? If this is something that you are currently dealing with the answer is simple, get your kid their own flashlight. Giving your kid their own light not only keeps them from using yours, it also provides them with hours of fun. If you decide to get your child their own make sure you get them the best flashlight for kids. Nobody is ever too old for shadow puppets. Giving your kid their own flashlight gives you the opportunity to teach them about shadow puppets. The best part about shadow puppets is the hours of quiet entertainment it provides at home or away. Shadow puppets require children to lay a flashlight on a table or other uplifted object so the light is pointing at a wall. Children (or adults) then place their hands in a variety of positions to make different animals or people on the wall. Don’t want to use your hands? Cut out different animals, people, or objects and glue them on popsicle sticks. Use your imagination to create an amazing puppet show. Morse code is always a useful thing to know. Using a flashlight even makes it fun to learn. Plus once they have mastered Morse Code your kids can use it to send secret messages to each other or anybody else who knows it. Print off an International Morse Code sheet for your children to use while they are learning. Even cheap lights with a simple on and off switch can be used for sending dots and dashes. Who needs ghost stories around the campfire when you have a blanket fort and a flashlight? The idea of storytelling with a flashlight is similar to ghost stories around the campfire as everybody is sitting in a circle. The person holding the flashlight is the one telling the story. What they do with the flashlight will depend on the story being told. A favorite is placing the flashlight under the chin to light up the story teller’s face. Flashlights can also be used to highlight objects of interest during the course of the story. One of the greatest ways to burn off energy is via a dance party. Plain dance parties get boring, so spice it up by turning it into a flashlight dance party. One of the great things about flashlight dance parties is they can be done indoors or outside. All you need to have a successful dance party is some great music and flashlights. Give each kid a light, turn on the radio, and let them dance the night away. Flashlights are a great way to teach your children about the different constellations. Stargazing in the city limits is nearly impossible because of the ambient light. Before heading out to the mountains you can create constellation cards to teach your children what to look for when you stargaze while camping. Creating the constellations requires you to draw the constellation on black construction paper. Use a hole punch to make holes where the stars would be. In a dark room shine the flashlight on the paper making sure the light is aimed at a wall. The light should only come through the holes. The constellation shape should then show up on the blank wall. This allows your child to see what each constellation looks like making it easier to find them in the sky on a clear night. Who doesn’t enjoy a good game of tag? Flashlight tag combines the classic game of tag with hide and seek to create a game played at night in the cover of darkness. Another great thing about flashlight tag is it is a fun game for all ages, adults and children alike can play together. How flashlight tag works is the person who is it holds the flashlight. The rest of the players then go hide in the darkness. Using the flashlight the person who is it goes around trying to find everyone. Upon finding somebody the person who is it shines the light on them and they are now out. The last person found takes over as the person who is it and another game is started. Almost everybody loves an obstacle course. Think American Ninja Warrior and Wipe Out. Using a flashlight adds a new twist to an obstacle course as that means the course must be maneuvered in the dark with minimal light. This obstacle course is best set up indoors using blankets, pillows, chairs, and other objects. Use the various objects to create an obstacle course that your children must get through using only a flashlight. Use masking tape, such as blue painter’s tape, to mark the course so they know where to go next. 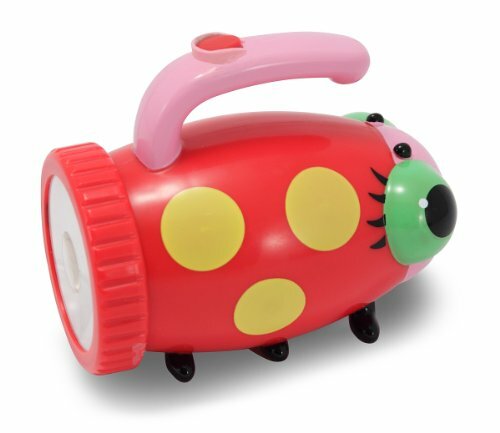 The Melissa & Doug Sunny Patch Mollie Ladybug Flashlight is the best light for toddlers for a variety of reasons. One of the biggest reasons why this light is so popular among parents with toddlers is its easy grip handle. The easy grip handle offers toddler hands a solid grip with plenty of room for toddler’s hands. The on and off switch is located on the top of the grip. Having the power switch in such a central location makes it easier for young children to manipulate. The switch itself is larger and easy to manipulate with a single finger. The Melissa & Doug Sunny Patch Mollie Ladybug Flashlight looks just like a ladybug, feet included. The light comes with 6 ladybug legs that allow the light to rest steadily on flat surfaces. The light provides a spotlight type beam that is suitable for both indoors and outdoors. The best part about the Melissa & Doug light is the numerous designs to choose from making it suitable for any young child. All kids end up losing or misplacing things that they own, including flashlights. One of the best ways to prevent the flashlight from getting lost or misplaced is choosing one on a rope. 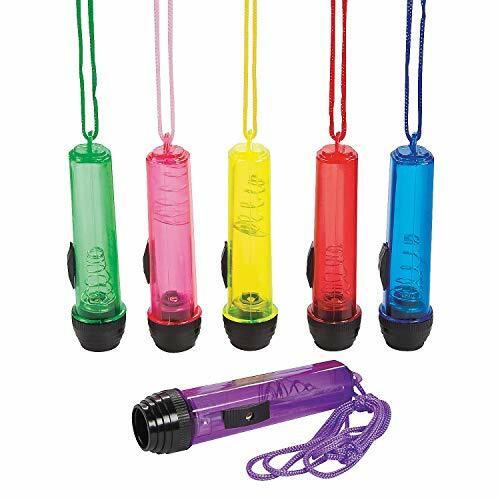 One of the best choices for kids is the Plastic Transparent Flashlights on a Rope. These lights come in packs of 12, so you will have plenty on hand in case one gets lost or misplaced. The Plastic Transparent Flashlights feature a transparent body made from plastic. The plastic is manufactured in assorted colors with matching ropes. The lights come prepackaged and you do not have a choice on color selection. The lights run on a single “AAA” battery and measure about three inches long. The short length makes them a perfect fit for smaller hands. Even with batteries installed the light is not too heavy for kids to continue wearing around their neck. If you are looking for a headlamp that will be used by kids you want something lightweight and easy to use. The Princeton Tec Byte LED Headlamp is a compact headlamp that is ideal for kids. There are several reasons as to why the Princeton Tec Byte is the best choice for kids, but the biggest reasons why is because of how much it has to offer. The headlamp offers single button operation and comes equipped with a lockout mode. 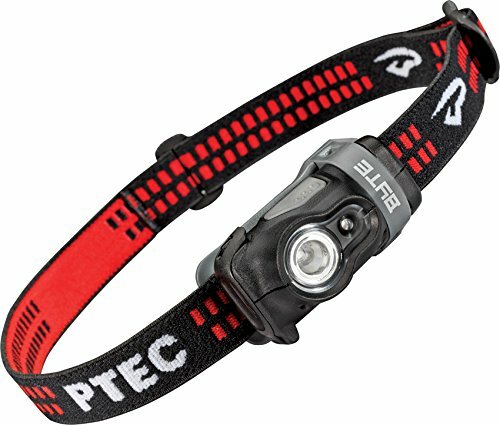 The adjustable Princeton Tec Byte is a high-quality headlamp that is made in the USA. The headlamp is ideal for camping, hiking, and many other outdoor activities, but also works quite well for nighttime reading. The Princeton Tec Byte offers two separate LEDs: white and red. The red LED is ideal for up close tasks and offers 35 lumens of light. The white LED offers two brightness levels, high and low. Powered by 2 AAA batteries the Princeton Tec Byte emits 50 lumens of bright white light for up to 80 hours. 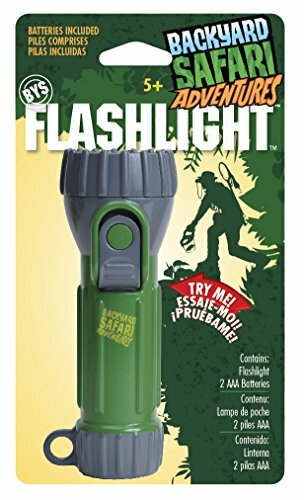 If you are looking for a flashlight that is considered a toy but offers a rugged and durable design, look no further than the Backyard Safari Flashlight. The light offers a green and gray color scheme that is sure to spark your child’s imagination. This light belongs to a line of toys geared for backyard safari adventures. With the Backyard Safari Flashlight, you never have to worry about battery drain as the light only comes on when the button is depressed. Once children let go of the button the light turns off. Adults use flashlights for spotting animals in the dark, now your kids can easily follow suit. The bright white LEDs are powerful enough to spot animals hiding in the bushes or even your lawn. The rugged light is 1.5 inches in diameter and 5 inches long making it the perfect size for kid’s hands. The hanging loop allows for the attachment of a carabineer clip to hang the light from a cargo vest or a belt loop. The Backyard Safari Light utilizes 2 ordinary AAA batteries for power and comes included with the light. If your children spend any time camping in the outdoors they need a light that can withstand the trip. They need something that is portable, but something that won’t break when dropped in water. For kids that spend a lot of time outdoors camping, hiking, etc. the Dorcy 45-2521 is the ideal light. The Dorcy light is not only waterproof up to about 1 foot deep it will also float rather than sink. 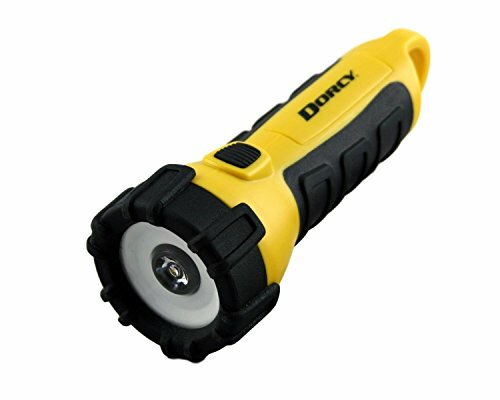 With the Dorcy 41-2521, you will find that at 150 lumens the light is bright enough to handle any outdoor task. The light runs on 3 AA batteries, which come included with the light. The batteries will last for 17 hours before needing to be replaced. If the 150 lumens is too bright for your child you can opt for the Dorcy 41-2510. The 2510 only emits a maximum of 55 lumens. Not everybody, including kids, enjoys a full sized flashlight. Sometimes you need a mini one to get the job done. 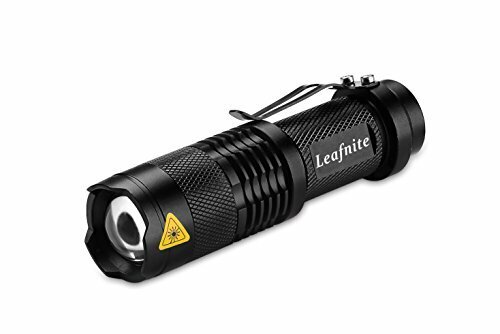 Plus mini flashlights often fit into kid sized hands better than ordinary flashlights. If you are looking for the best mini light for kids look no further than the Leafnite SK98 Kids Mini Flashlight. Despite its small size, it has more than enough power to get the job done. The Leafnite SK98 is constructed from an aluminum alloy adding to its solid construction. The body of the light offers a skid-proof design allowing for better grip, which is important with kids. The light can be powered by a single battery and users have the choice between an ordinary AA or a rechargeable 14500. The focus adjustable white light offers three different output modes that are accessed via the tail cap switch. The best flashlight for kids is going to vary based on certain factors. The best light for a toddler isn’t going to be the best light for an older child. Each of the lights in the above categories is the best for a specific reason. To choose the best light for your kid you need to consider their age and abilities, as well as what they will be using the flashlight for. Now that you know about some of the different lights, go on out and purchase one today.